Bomb disposal experts were called to a school in Hamilton, South Lanarkshire this morning amid reports that a pupil had brought a hand grenade into the building. The pupil at Hamilton Grammar School brought the decommisioned device to class as part of a history project. Explosive Ordnance Disposal officers called at the school shortly after 9:00am, and ascertained that the grenade posed no threat. 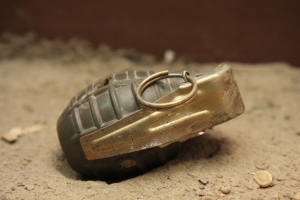 A spokeswoman for South Lanarkshire council described the grenade as a “presentation piece”, owned by the pupil’s grandfather. Ah, yes … just like the good old days here, when things were actually evaluated on a case-by-case basis. Now? Fuhgeddaboutit. Click here for the source.